Want’s to thank coaches… should blame teachers? That’s not a misplaced apostrophe. It’s just, uh, a contraction of *want us*. Ahem. 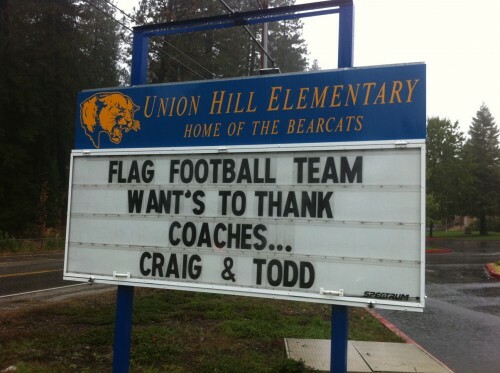 From Union Hill Elementary (surprise) in Union Hill, CA. Photo taken yesterday (10-24-2010). Tagged with coaches..., elementary, flag, football, school. To add insult to injury, the apostrophe is upside-down.